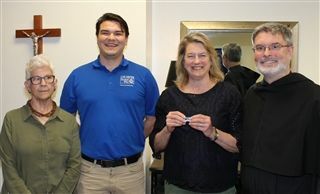 CFO Karen Tennery (third from left) was surprised last week by a representative of United Way, Chase Mowery (second from left), who made a special trip to campus to present her with the Leadership Giving Award. He thanked her for giving at the Leadership Level and being a longtime, generous supporter of the United Way in Tulsa. They are pictured here with Headmaster Fr. Philip Cook, and Mrs. Bonnie Leighty who is the Cascia representative for the United Way campaign. "I value giving to the United Way because it supports so many important organizations that provide meaningful services to those in need and the underserved," said Mrs. Tennery.